We are more or less familiar with car insurance payment. Every month or every year we pay a certain amount of money to an insurance company so that if we encounter an accident, we won't have to worry about the loss. If you did not buy insurance then you had a risk of facing an accident and losing a big amount of money. Now, after buying insurance, you are losing a small amount of money for certain but you are protected from losing a fortune if you encounter an accident. The money you are paying is the calculated risk premium for you. The insurance company evaluates the probability of getting an accident for you based on your driving history and evaluate a risk premium for you. Let's see what this number actually mean in economics and finance. We will also learn how to calculate the risk premium. A risk premium is a number that tells you how much money you are giving up or paying someone just because you want to avoid a risk completely. The agent whom you are paying the risk premium will take the risk for you. We presented an example in the documentation for "Certainty Equivalent Calculation". You have prepared a business plan. According to your plan, you need to invest 50,000$ in your business. Within a year, you can expect a profit of 400,000$. But there is a 50/50 chance that you may lose all of your investment money and gain nothing. Your business plan is so solid that, one of your friends proposed you to buy out the business plan from you for 5,000$. The condition is that, you won't execute that plan, rather your friend will do that. Your friend will invest his money and take the risk. You simply get certain 5,000$ for giving up the business opportunity. If you calculate the Expected Monetary Value (EMV) of this Business Opportunity, you will find that. What do you think? will you give up the business opportunity for 5,000$? If so, then your Certainty Equivalent is 5000$. The Risk Premium is the difference between the Expected Monetary Value and the Certainty Equivalent. So, when will you want to give up the business opportunity for such Certainty Equivalent? You will do that when you are afraid of the risk and you want to avoid the risk by all means. Or say, you cannot afford the loss of 50,000$ at the worst case. Therefore, when you accept this Certainty Equivalent, you are paying 170,00$ as your Risk Premium. We have explained how to model a Utility function and incorporate to a Decision Tree in the "Certainty Equivalent Calculation" example. You can follow the same steps that you did for getting the Certainty Equivalent metric. 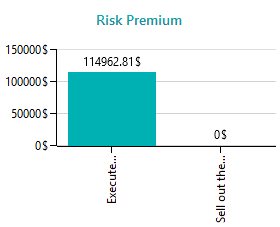 In that same Metric panel selection, you will find a checkbox for "Risk Premium". You can check that checkbox and the Risk Premium chart will also be displayed in the Carts Carousel. Remember that, we modeled a Utility Function in the Certainty Equivalent Calculation example. 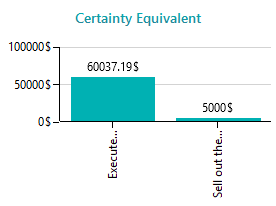 According to that utility function, we found the Certainty Equivalent value as 60,037.19$. We calculated the Expected Monetary Value (EMV) = 175,000$. So, according to the Risk Premium Formula, RP = EMV - CE = 175,000$ - 60,037.19$ = 114,962.81$. 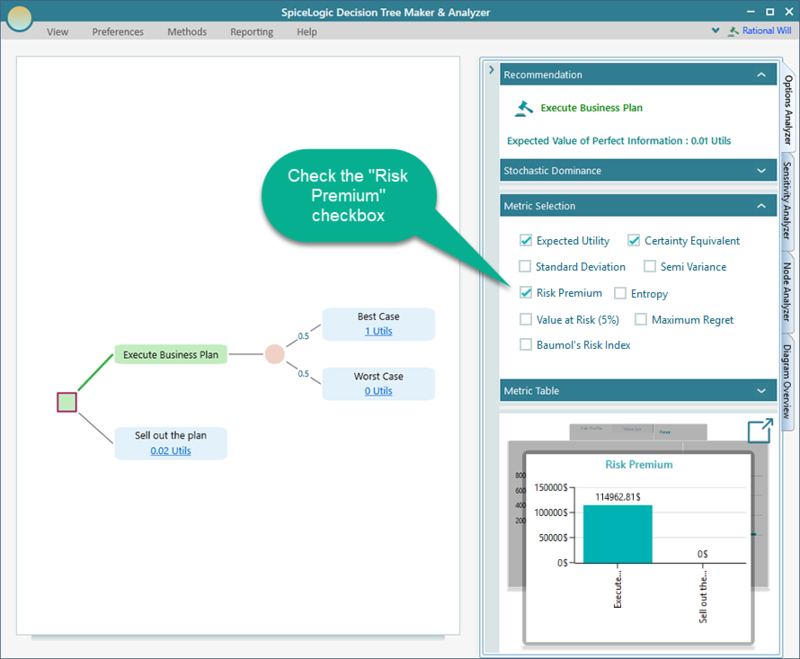 The Decision Tree Software calculates the Risk Premium and displays this value in the Chart Carousel as we saw like this.